High-altitude, daylight attack on Yokohama urban area. 517 B-29s were escorted by 101 P-51Ds. 2,570 tons of bombs were dispensed, 6.9 square miles burned out. 14,157 Japanese died, were injured, or missing, 79,017 houses were destroyed, and 42 percent of the city area was burnt to ashes. The cities of Japan were vital to the ongoing war effort. Japan dispersed manufacturing to prevent precision attacks from interfering with productions. Small factories were extremely vulnerable to incendiary attack. US Army Air Forces Major General Curtis E. LeMay decided to switch from chief reliance on daylight precision bombing of selected targets to night incendiary attacks of Japanese cities in early March 1945. The first incendiary attacks against six of Japan's greatest cities were very effective. The tonnage of bombs dispensed was extremely high, losses were very low, the rate and frequency of operations were unconstrained by poor weather, and the devastation of urban and industrial areas was startling. 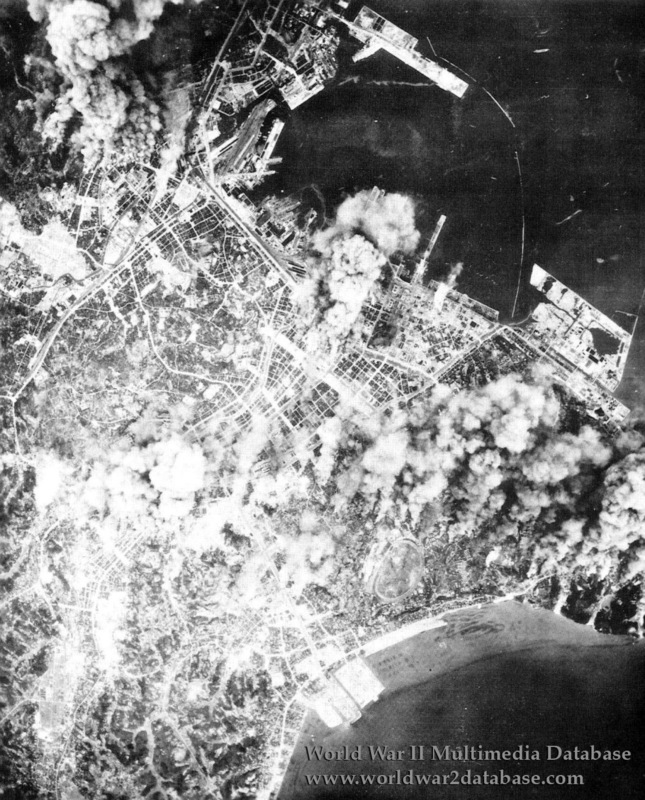 After the B-29s were released from attacking airfields in support of the invasion of Okinawa in May 1945, LeMay resumed intensive incendiary attacks on Japanese cities at once. With the destruction of the Japanese air forces and their decision to conserve aircraft for the final ground invasion of Japan, LeMay was able to mount daylight incendiary raids as well. During the concentration on incendiary bombing of urban industrial areas, there were 17 maximum-effort attacks entailing 6,960 B-29 sorties and 41,592 tons of bombs. Losses were 136 B-29s or about two percent of the sorties. Thereafter, LeMay turned to the smaller cities on his list, eventually assaulting and devastating a total of 66 urban areas.